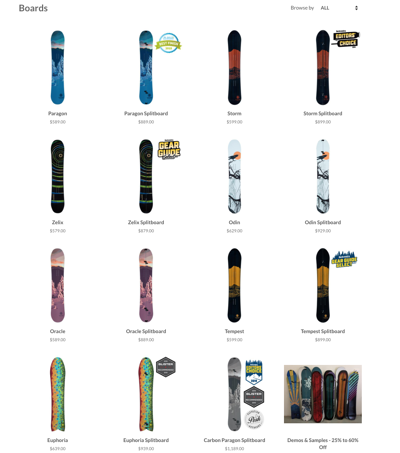 After some difficult years, tracking data shows the snowboard industry is on the rise again. Winter/snow sports gear sales grew 7 percent from August through December 2018, to $4.3 billion, according to The NPD Group. One brand from Colorado that attended the 2019 OR/SIA Snow Show was Venture Snowboards. Lisa Branner co-founded Venture with her husband Klem. Lisa wears a lot of hats for Venture. My co-writer, Casey LeBrun was able to find some time in Lisa's busy schedule to visit with her. Lisa talks about what she sees for 2019 and some insights on marketing. Due to declining sales a few years ago, the industry experienced a shakeout, with both consolidation and closings. Brands delivering quality product and experience are now poised to reap the benefits of increased sales. The dogmatic boundaries that used to separate snowboarding and skiing are evaporating. Snowboarders and skiers share the same routes and hang out together through participation in snow clubs, on the slope and off. Snowboarding is part of a bigger outdoors movement. The majority of the industry has left behind its original "bad boy" image to celebrate that snowboards offer a means to experience the "joy of being outdoors" in winter. There is a tremendous growth opportunity in the sport with women. "If there are no women who make decisions and work in management positions, you will never reach the women's market. In my opinion, the number of female managers and the growth in the women's sector are tied to each other. Many companies have tried to appeal to women, but in the wrong way. Because it's important that a woman decides what's cool for another woman. If all these decisions are only made by men, nothing will change - they don't know what we women really like." Venture has its roots and future grounded in building snowboards that continue to reflect the individual narrative of snowboarding combined with technological innovation. Venture was founded in 1999, beginning their lifelong pursuit of crafting unrivaled snowboards for maximum mountain enjoyment and performance. Every Venture is handcrafted by snowboarders in their Silverton, Colorado factory and tested in some of the most demanding terrain in the lower 48. The mountains dictate the design; countless hours of rider R&D go into every product, including hands-on testing through snowboarding. The OR/SIA Snow Show featured brands catering to freestyle, freeriding, carving, and splitboarding. Talking with brands like Venture and others, it is clear that snowboarding is evolving and there are wide opinions on where the industry is headed. Another emerging trend that is clear, is that the vast majority of snowboarders are what can be defined as "all-rounders." This has fueled overall growth in the creation of all mountain types of boards and splitboarding. As more newcomers decide to try out snowboarding, there is an emphasis on creating boards that allow the users to experience the pure fun of snowboarding and spend time with their friends who ski. Freestyle and powder seeking consumers also continue to influence the development of product and brand strategies. As those snowboarders who initially started the snowboarding trend age and become parents with children, a new generation of snowboard enthusiasts are entering the market. Snowboarders ages 17 and under now comprise 34.3 percent of the total population of riders in the U.S. In another win, the number of youth female shredders grew notably from 792K to 846K. The sport’s spike amongst youngsters is supported by youth-centric programs, beginner-friendly advancements in equipment and resort features, and the inspiration of professional athletes keyed into social media. You can follow Venture at #VentureSnowboards #WeAreVenture, @venturesnow, Facebook, and on YouTube. Check out how to grow your e-Commerce.